Here is our shortened blog version of an article written by Liz Beatty for National Geographic online. We have to admit, we're pretty happy to hear more kudos for a river we know to be a gem among gems. No one returns from the Nahanni unchanged. It’s too big, too old, too wild. The morphing begins as visitors soar west in a Twin Otter plane from Fort Simpson, in the Northwest Territories. Below, vast boreal plains reach toward cave-riddled karstlands of the Ram Plateau. Soon descent begins into Canada’s deepest river canyons—a 200-mile ancient waterway, home to the Dene people for thousands of years. “Many say if the trip ended here, they’d have gotten their money’s worth,” says veteran Nahanni guide Neil Hartling with a chuckle. But go farther along the Nahanni River, and Virginia Falls—or what in the Dene tongue translates to “big water falling”—thunders as it drops 302 feet, nearly twice the height of Niagara. Rare orchids thrive in its billowing mist. Canada’s most revered river expedition brims with lore of Klondike gold prospectors, trappers, adventurers, and their gory misfortunes in places named Headless Creek and Deadmen Valley. Ahead: the Gate’s plunging sandstone chasm, neck-high mud baths at Kraus Hotsprings, maybe a tin plate of arctic char riverside. 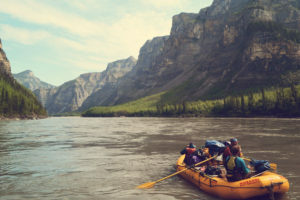 In a nation built on legends of daring voyageurs paddling its myriad waterways, the Nahanni is deep Canada—le Canada profond. It beguiled late Canadian Prime Minister Pierre Elliott Trudeau. A master canoeist, he paddled here in 1970 and was instrumental in having it made a national park reserve. With the help of his eldest son, Justin (now vying for his father’s old job), the reserve has grown sixfold. When to Go: Paddling season runs from mid-June to September. Early season brings nearly 24 hours of daylight (and more insects), while the late season offers the possibility of seeing the northern lights. 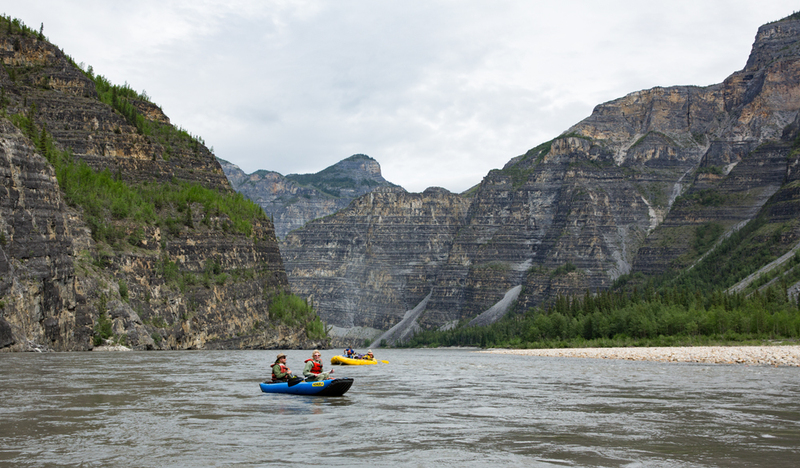 How to Get Around: The safest and most convenient way to explore Nahanni is via a paddle trip led by a registered, licensed outfitter such as Nahanni River Adventures. Trips vary in length and skill level and can include hiking and rafting. 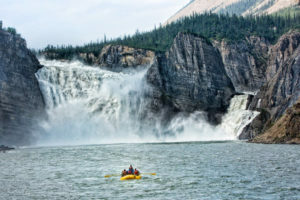 Floatplane daytrips to Nahanni via Simpson Air are a less taxing yet more expensive way to see Virginia Falls and surrounding areas. What to Read Before You Go: British-born adventurer Raymond Patterson’s The Dangerous River: Adventure on the Nahanni (TouchWood Editions, 2009) chronicles his 1920s expeditions as one of the first outsiders to journey up the Nahanni River. Fun Fact: It’s been more than a century since the headless corpses of two gold prospectors were discovered in 1908 in what’s now Nahanni National Park Reserve. Yet their haunted legend lives on in park locations like Headless Creek and Headless Range. Insider Tip From Liz Beatty: I recommend Nahanni River Adventures (of the three licensed to guide here). Founder Neil Hartling has written two books about his three decades in this wilderness (he guided Justin Trudeau). Neil’s quiet, even-handed nature seems akin to what I imagine of Raymond M. Patterson.